Olde Village Inne Brooklyn Brewery Pint Night - Oak Beverages Inc.
Olde Village Inne Brooklyn Brewery Pint Night, Thursday, April 4th, 6pm – 9pm. 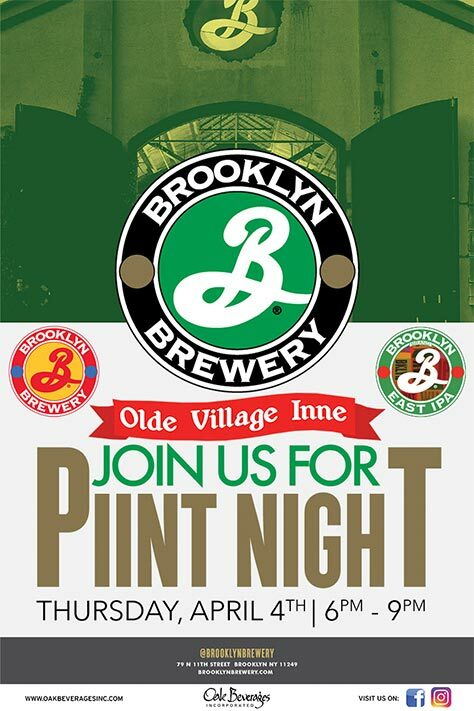 Join us for Brooklyn Brewery PINT NIGHT at The Olde Village Inne. Plenty of IPAs will promise you the moon and the stars, looking to seduce you with words of smashing bitterness and hops everlasting. Actually, we’re not here to “blow you away with a lupulin cannon,” or “peel the enamel off your teeth.” East IPA is a clean, drinkable IPA that’s packed with flavor and offers a bold balance, not a smack in the head. American hops soar in the bright piney aroma, while East Kent Goldings hops bring the taste of stone fruits and firm bitterness from IPA’s ancestral British home. Give our East IPA a try with some rich crab cakes or salmon, strike up a conversation with farmhouse cheddars, and find harmony alongside spicy dishes. East IPA’s blend of tradition and exuberance sets the standard for hop-driven deliciousness. Food Pairings: Spicy foods, especially Thai, Indian, Vietnamese, Malaysian, Szechuan, and Mexican dishes; denim jackets, crab cakes, sweet sunglasses, family holidays, and farmhouse cheeses. Since 1994 the Olde Village Inne has been the melting pot of downtown Nyack pub scene. It is now Nyack’s Historical longest established Pub. Travelling to Ireland for authentic food is not necessary as a little piece of Ireland is right here at the OVI. For those hankering traditional Irish fare you will find it here on our updated menu, featuring hearty Irish dishes, like Sausage Rolls, Fish & Chips, Chicken Curry, Shepherd’s Pie, Bangers & Mash, Chicken Potpie & Irish Lamb Stew. OVI has a large selection of American cuisine including wings, burgers, pizza & nachos. The OVI boasts a healthy adoration for Guinness, the full bar selection include sixteen types of beer on tap and spirits that any traditional pub would have. Stop by to see all the new changes at the OVI, including their new wine list, Kids menu. Jukebox & TVs!! Kitchen open 7 days a week ‘til 3AM for your dining or takeout pleasure. Gifts Certificates are available in any denomination. Posted in Featured Promo, Pint Night, Tasting Event.